Simply Quince is the first cookbook devoted exclusively to the quince--a fragrant relative of the apple and pear. The quince first took root in the soil of historic Armenia and today wild quince trees grow in the Caucasus Mountains and across Armenia, Georgia and northern Iran. 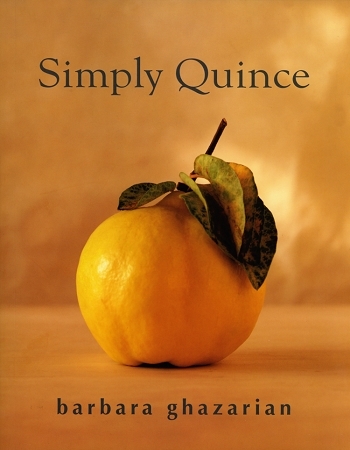 The fruit is normally found in jams, jellies, compotes, preserves and pies, but in Simply Quince, Barbara Ghazarian introduces readers to a variety of other ways quince can be used: in salads, savory stews, scrumptious side dishes, in condiments for roasted meats and in a wide assortment of desserts. These simple and reliably delicious recipes explore the mysterious and ancient fruit that is the quince. All the recipes were tested, tweaked, retested until they reached perfection. Each one showcases the fruit's mild flavor, delicate aroma and exotic look in an entirely unpretentious way.